This is a fantastic price for this system. looking at the picture, I believe the receiver supplied is the Silvercrest SL65, although someone has mentioned they got a Comag Porty 2 in their package, which is ideal for fellow caravanners like myself, as well as campers & motorhome owners, as it will run on 12v, or 240v when on EHU, or could even be used as a home system. Based on the included dish size, you should be able to watch FTA channels from Eurobird & Astra, and I've also read good reviews for Hotbird reception as well, although this could be affected by your location in relation to the satellite coverage footprint. At this price I wouldn't expect their stocks to last long, Good Luck! Very good deal but appears to be area-specific....not in Wales or South East, only the Midlands...****! I brought one from Lidl a few years ago. They are a nightmare to set up as the dish is so small! However, they work well once installed. We up-graded to an old sky dish and connected it to the box and it is fine. Very good deal but appears to be area-specific....not in Wales or South … Very good deal but appears to be area-specific....not in Wales or South East, only the Midlands...****! Shame! I'm afraid most Aldi / Lidl special deals are dependant on location.I believe Aldi also sell their version of this system (Tevion) from time to time, which you may be able to get in your area. If it's any help, I've checked all of my nearest stores, which are Aylesbury, Luton, and Milton Keynes, and they will all be stocking this system. Sorry to get all noobish but what kinda channels can you pick up on this? Description says free-to-air channels, but also says you can pick up 4500 channels? I'm confuzzled and my knowledge on satellite TV technology is below basic. Sorry to get all noobish but what kinda channels can you pick up on this? As well as all the european ones that are FTA so you can get your premiership footie on it from german, norwegian ect channels! Can you really get the Prem football on this? Surely everyone would have one if it was that easy. I think there are no FTA channels that show EPL footy, they're just subscription ones from foreign providers so would either need a card or use of other means. The 4500 channels refers to how many can be stored on the reciever - i.e you could probably store all of Skys channels on 28.5 east but the subscription channels would be scrambled. For enthusiasts who like foreign channels then astra 1 on 19.2east is great for things like Grand Prix and other things. Nearly all premier league football on all satellites is scrambled so no as it stands. One or too of these channels used to be available using software decoders that you could load on to this receiver but sadly most have much more robust encrytion these days. Also you would need a bigger dish than this for all satellites except Astra 2 which is where the UK services are located. Thanks guys, I thought so. You've saved me the trouble of getting one as I don't really wanna watch foreign soaps. I don't even like our soaps. Nearly all premier league football on all satellites is scrambled so no … Nearly all premier league football on all satellites is scrambled so no as it stands. One or too of these channels used to be available using software decoders that you could load on to this receiver but sadly most have much more robust encrytion these days. Also you would need a bigger dish than this for all satellites except Astra 2 which is where the UK services are located.Must admit been afew years since I had a dish and watched footie on it but norwegian cvhannels NRK1 and 2 always used to show them live but I guess they have clamped down on that now! How easy is it to tune in, I take it you'll need a signal finder? You can use the same kit, and buy another box to get "Freesat" which is a vast improvement on Freeview. 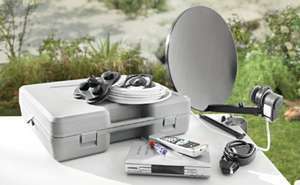 The receiver is capable of storing 4500 channels but you won't get them with the small dish supplied. Connect it to a 1mtr dish however and that opens up maybe a dozen satellites from the UK. If you were to set up the system to each sat one after the other you could probably fill it with 4500 channels but you'd only be able to watch the ones on the sat you're pointed at, and you'd have to physically reposition the dish to watch channels from a different sat because it doesn't do motorised. You can use the same kit, and buy another box to get "Freesat" which is a … You can use the same kit, and buy another box to get "Freesat" which is a vast improvement on Freeview. Why wouldn't the box that comes with this receive Freesat.........? Anyone know what advantages this has over the DVB-T Indoor Aerial they also have on sale for 8.99, apart from a few more foreign channels? Anyway, DVB-T is utter rubbish and indoor aerial is just a mistake - it is not going to work unless you live next to transmitter I have never seen DVB-T working correctly using indoor antenna. Ah, camping! The great outdoors! Fresh air, open space for the kids to run around, get the kite out... nah, let's sit and watch telly like every other day of the year, just in a slightly different area of the planet. @chrisdpaul: lol, you meant a few hundred more? :DAnyway, DVB-T is utter … @chrisdpaul: lol, you meant a few hundred more? :DAnyway, DVB-T is utter rubbish and indoor aerial is just a mistake - it is not going to work unless you live next to transmitter I have never seen DVB-T working correctly using indoor antenna. All my tvs run analogue, DVB-T and DVB-T2 using metal coat hangers for antennas and receive all channels without an hitch. Having said that I am only 12 miles from the Emily Moor Mast. We live in Liverpool and can pick up both the Granada and HTV Wales DVB-T regions with an indoor aerial and the picture is very stable with no break up. With live about 30 odd miles from both transmitters. Used to be able to pick up Central and I've heard of people picking up Yorkshire around our way too back in the analouge days. Not sure if we could still get them in digital these days (presuming both are post DSO). I know they're both available on Astra 2 now but I might just give them a try one day with the aerial for old times sake! I have one, and a signal finder, but use THIS box instead of the signal finder when setting up my Sky box for caravan use as the "meter" on it is more sensitive and responsive and has a variable pitch tone so you don't need to constantly look at it! I got satellite for caravan specifically for the opposite reason! Both analogue and digital terrestrial is so lousy when away from big cities! The receiver only consumes 2w on standby, 12w in use, so if you're running a TV anyway, you'd hardly notice any additional impact on your leisure battery, about the same as one of the small 12v striplights ;).As for being useful, well the advantage of a satellite system, is that as long as you have a clear line of sight to the satellite, then you can always get a very good signal no matter where you are (unless you're outside the satellites footprint, unlikely if you stay within the UK), whereas terrestrial TV, is affected by buildings, hills, trees, interference etc.The problem we have now, is that any digital TV system, tends to either work, or it doesn't, so unlike analogue TV, which just pulls in a weaker/fuzzier image, digital will just freeze, or some channels may not work at all, so quality of reception is more important.Having said that, satellite TV can be affected by seriously bad weather, but for this price, I would say it's well worth having, even if you do have Freeview. This may help some of you deciding on whether to go for this deal or not, I've found a direct link for the Silvercrest SL65/12 English manual in PDF format..
BTW, please don't vote cold, just because you hate caravan / motorhome owners, it may not be to your liking, but well, it's each to their own really isn't it.Don't think we all sit in a caravan / motorhome watching TV all day either, life's too short, but yes, sometimes it's nice to have the option, especially when the British weather is trying it's best to stop you doing anything else! Could I pick up FTA channels in Denmark? Just for info, It's out of stock in the 2 stores on the east side of coventry as of 10:30 a.m. In one of those stores the guy serving denied they were even selling them until I showed him the advert, how many could they have had? Just bought this from local store - box is the Comag Porty2. OK, well Comag is actually the brand behind the camping Silvercrest and Tevion boxes anyway, and the Porty 2 is just a slightly older receiver compared to the SL65.I was pretty sure looking at their ad picture that the box had the Silvercrest logo, not that it really matters.Anyway, glad to hear you got one OK.
Good price for what you get.Only really useful for FTA channels though. There was stock in my local stores (Beds), but as with most of these Aldi or Lidl deals, the deals offered vary from store to store according to location.If you go to Lidl's website, and enter your postcode, it will then show all the valid deals for the stores in your area.If your store should have the deal, but haven't got stock, then they may have sold out (I've seen a few Aldi / Lidl deals disappear with in an hour of opening! ).It's sometimes worth asking the store manager (if you can find one! ), because they operate with so few staff, that not everything always reaches the shop floor when it's supposed to. Anyway good luck! BTW Aldi do a similar deal on this package, sometimes badged Tevion, which could be worth keeping an eye out for if you're unsuccessful finding any in your Lidl stores.